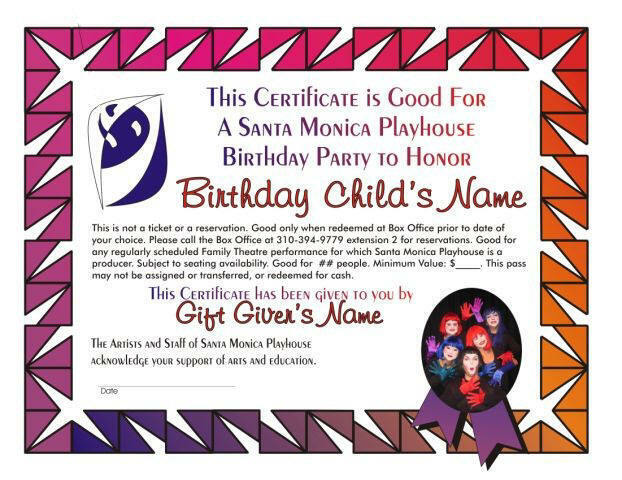 We have a wide range of gift certificates available, great options for ages 2 to 102! 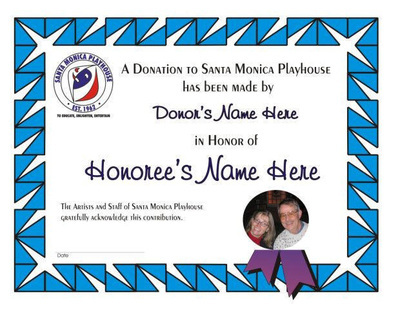 All options come with an elegant, full-color certificate announcing your special gift. If you'd like to purchase a gift certificate, please call 310-394-9779 ext 1 or email us. Thank you! $25 for "Mommy or Daddy and Me": Includes 1 adult ticket & 1 child ticket to any regularly scheduled Family Theatre musical and $5 to spend at our Hole-in-the-Wall at intermission. A special treat for any youngster in your life! $50 Family Pack: Includes 4 tickets to any regularly scheduled Family Theatre musical (good for kids or adults). Fun for everyone! 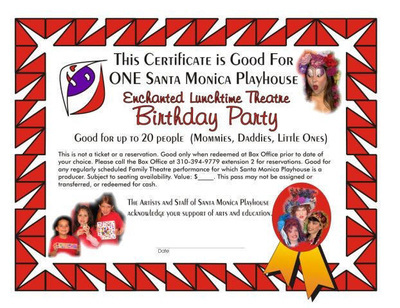 $250 Theatre Birthday Party: A theatre birthday party for up to 10 kids and 4 adults. Youngsters have a special theatre-themed party, playing acting games and partying down with a gaily-costumed fairytale character, with plenty of time for birthday cake and punch. Then it's into the theatre for one of our award-winning Family Theatre musicals. At the end of the performance, the Birthday Child makes a guest appearance on stage and receives a specially autographed gift as the entire audience sings "Happy Birthday!" $25 Treat-for-one: Treat yourself to a night of theatre, without having to worry about anyone else! It's also the perfect gift for the loner in your life. Includes one ticket to any regularly schedule main stage production. $50 For Two: Take a special someone for a theatre treat. Friend, spouse, sibling, partner? Perfect for any duo. Includes two tickets to any regularly scheduled main stage production. $100 Double Date: Four tickets to any regularly scheduled main stage production. Set up a double date, or grab a group of friends; the more, the merrier. $500 "Host a Theatre Night": Grab a group of up to ten friends for a special VIP theatre experience. Includes ten tickets to any regularly scheduled main stage production and a meet'n'greet post-show reception with cast and crew (includes nibbles and treats!) Perfect gift for the true theatre lover. 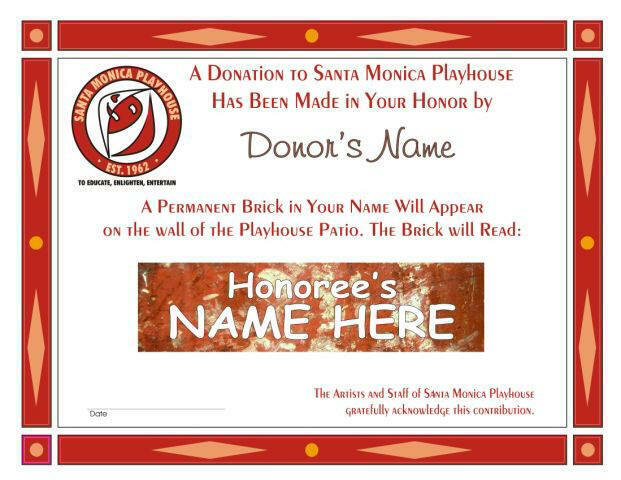 Honor family, friends, loved ones, with a personalized patio brick, theatre seat plaque, or wall plaque in their name or with a special message, or a sponsor a deserving student actor in our Education Conservatory program (and support the Playhouse at the same time. Truly the gift that keeps on giving.) A gesture that will last forever.